The process of getting a FCC license for 3.65 can be daunting. In addition, there isn’t much information out there about how to register sites using gear that doesn’t cost thousands of dollars. In particular, I am speaking of Ubiquiti 3.65 or Ubiquiti + MikroTik 3.65 GHz products. I posted a link HERE to get you to the HowTo. I hope this helps you in your process! I finally got around to looking at the new AirVision software from Ubiquiti that is the companion product for the Ubiquiti AirCam. I have to say it is really nice. Everything is done through a web browser without silly Active-X controls so us Mac users are happy. 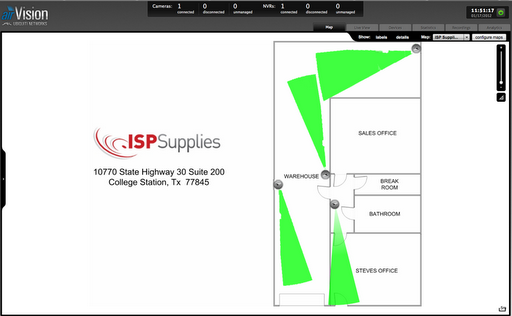 I created a quick Visio drawing and added our office cameras to it quick and easy using their drag and drop. I definitely recommend both Ubiquiti AirCam and Ubiquiti AirVision. We received a large shipment of AirCams last week and every one flew out the door. We expect more next week at ISPSupplies.com.